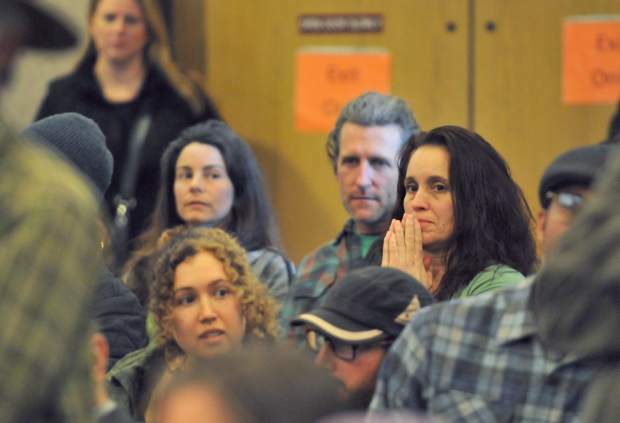 Attendees of Tuesday's special board of supervisor's meeting listen to the public comments of those for and against cannabis in Nevada County. County supervisors listened to over 2.5 hours of public comment before discussing the proposed ordinance themselves. 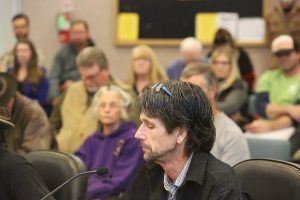 It’s possible the Nevada County Board of Supervisors could implement a temporary licensing system for cannabis growers this spring, though it appears a permanent ordinance won’t be ready for months. Additionally, county staff told a crowded room at a special called meeting Tuesday that they intend later this month to propose a marijuana tax for the November ballot. The discussion came after some two hours of public comment about the draft cultivation ordinance currently being written. In that discussion supervisors heard staff can have a draft ordinance ready by May 1, meeting a deadline growers have requested. However, an environmental review required by the California Environmental Quality Act — which must be completed before supervisors pass the new ordinance — won’t be ready by May 1. The county potentially could enact a temporary licensing program before the passage of the new ordinance, though that would require a tweak to existing cannabis law, which currently forbids commercial activity, said Alison Barratt-Green, county counsel. County staff said they might need to limit the number of temporary licenses they allow, to lessen the possible impact to the environmental quality act. Supervisors also heard from Alison Lehman, assistant CEO, who said staff on March 27 will present information about a possible marijuana tax for the November general election. 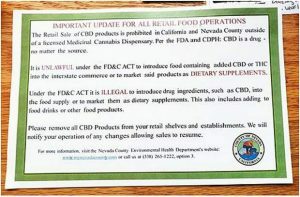 The tax, if passed by the voters, would apply to cannabis products and be in addition to any state tax. Money raised from the tax could go toward the enforcement of the permanent ordinance. Lehman cautioned details of the potential tax remain in flux. “It’s being evaluated right now,” she said. Supervisors spent part of their meeting giving county staff more details about what they want in the draft ordinance, at one point focusing on a possible registry for personal grows. State law allows homeowners a maximum of six plants indoors. Supervisors have discussed allowing some outdoor personal grows in certain zones. Supervisor Heidi Hall opposed a registry, saying the county should prioritize the commercial, medical grows they want to regulate. “I want the resources to go toward the grows we’re talking about here,” she said. Supervisor Richard Anderson disagreed, calling the impact of personal grows a big issue. He said the county should have some regulations in its code, though its enforcement priority would be a separate issue. Supervisors declined to impose screening requirements on outdoor personal grows. “For a personal grow, I don’t think it’s that big a deal,” Supervisor Ed Scofield said. Supervisors already have said they will limit commercial grows to medicinal only at this time. On Tuesday they said commercial grows would be capped at 10,000 square feet and must be on at least 20 acres. Barratt-Green’s office will shoulder the bulk of writing the draft ordinance. That ordinance must proceed to the Planning Commission before advancing to supervisors. Supervisors on Tuesday heard over two hours of public comment, which ranged from strong opponents of cannabis to supporters urging the board to allow recreational grows. Patricia Rockwell argued that limiting county grows to medicinal only would restrict access to the legal market, because local growers would have fewer buyers. She also asked supervisors to limit the number of licenses someone could hold. David Cooper, who identified himself as a farmer and family man, said growers needed a transition period to provide time to come into compliance. “We are running a business and it does take a lot of time, money and effort,” he said. Charlie Price asked supervisors to forego an ordinance that forces a one-size-fits-all regulation on all aspects of cultivation. He prefers letting neighbors resolve issues through easements or letters of permission. “Please don’t over-regulate,” he said. Brad Peceimer also encouraged supervisors to allow notarized letters of permission that neighbors would provide to growers. Song Kowbell told supervisors about how her oddly shaped property, when setbacks and visibility are considered, could restrict her ability to grow for herself. Many others asked supervisors to restrict cannabis grows and keep the pungent smell of the plant out of neighborhoods. Fran Freedle called the existing ordinance a test of whether people will comply. “What we have learned — there has been lots of noncompliance,” Freedle said. Her husband, Wade Freedle, said the county should allow no marijuana activity, other than what state law allows. “Narcotics exacerbate every aspect of cultural decay,” he said. Michael Baker asked the board to prohibit any outdoor grows in residential areas. Tom Fletcher echoed the sentiment. “When I see that ‘R,’ I think of families and families with children,” Fletcher said of residential zones. Vernon Elkins said he felt like a minority at the supervisor meeting. However, in his Lake of the Pines neighborhood his opposition to commercial marijuana places him in the majority.